Both FEMA and the Red Cross recommend that every family in the United States be fully prepared for any major natural or unnatural disaster, including an earthquake, by creating a survival kit. Every emergency preparedness kit should include essential items that can support the basic needs of every family member until assistance arrives. With nearly everyone in the United States living in an earthquake zone, being fully equipped with an emergency earthquake kit will reduce the peril from the natural disaster experienced by the family. Every disaster preparedness kit will contain water, an essential emergency food supply, first aid kit, and other critical items. Creating a disaster preparedness kit to be fully equipped during an earthquake event could be exactly what you need to save lives, including your own. According to FEMA (the Federal Emergency Management Agency), it is crucial to develop a plan well in advance of any potential emergency that could happen in your community. Part of their recommendations includes building a survival kit to be fully prepared for any disaster, including a devastating tremor. These emergency kits will contain most every item likely needed to survive the disaster. Over the last decade, the Earth has experienced higher levels of seismological activity – earthquakes. With a recorded half million quakes happening around the world each year, only about 1/5 can be sensed by humans, and only about 100 of those causing significant damage. Southern California alone has approximately 10,000 earthquakes every 12 months, with a high majority of them never felt by individuals. Oftentimes, mild and severe quakes will occur naturally without any warning. To ensure your family remains safe, it is important to gather together an emergency food supply, including MRE kits (meals ready to eat), as part of an earthquake preparedness kit. The movement or shaking of the ground is seldom the reason anyone is ever injured or dies. Most likely, the high majority of casualties from a quake are a result of falling debris or objects, along with completely/partially collapsed buildings including falling fixtures, plaster, bricks and chimneys. Putting together an disaster preparedness kit is a simple process. The (survival kits) contain basic household items that will be necessary in the event of a disaster or emergency. Because mandatory evacuation will likely arrive unexpectedly, it will be important to have quick access and easy portability of all your basic necessities, including your emergency food supply, stored close at hand. FEMA offers their recommendations of all the necessary supplies to create a well-stocked emergency preparedness kit, filled with the best disaster items, including an emergency food supply, for every natural disaster. 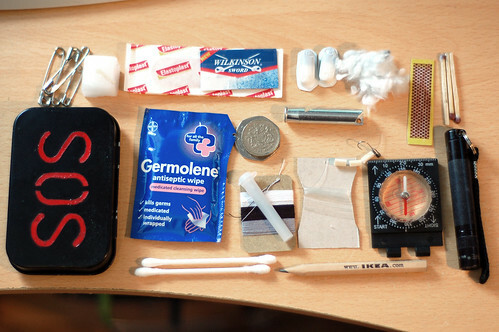 The emergency kits should include the following. Plenty of Water – All survival kits should supply each person in the party with enough water (1 gallon each day for three days) to be used for drinking and their hygiene (sanitation). Non-Perishable Food – Each person in the party will need enough non-perishable foods as part of their emergency food supply, especially meals-ready-to-eat (MRE kits), to last three days. First Aid Kit – A well-stocked first aid kit is an essential part of every disaster preparedness kit. Flashlight – All emergency kits need to contain a bright flashlight, such as a Maglite, with additional batteries. NOAA Weather Radio – Having access to the NOAA weather station will provide all detailed information on the natural disaster concerning the weather and other climate conditions. Battery-Powered Radio – Having either a battery-powered radio (with extra batteries), or one that operates with a hand crank can keep you up-to-date with news concerning the disaster in your community. Local stations on your emergency radio or TV broadcast will provide details on where to find an additional emergency food supply once the Red Cross, FEMA and other agencies arrive to provide assistance, medical care, and much needed items. Garbage Bags – The supply of garbage bags, with plastic ties, should be included in your disaster preparedness kit, along with moist towelettes, to help control personal sanitation. Whistle – With a loud or noisy whistle, you and family members can continually produce a signal for help until assistance arrives. Can Opener (manual) – Because most of your non-perishable emergency food supply will be stored in cans, it is essential to have a manual can opener in your earthquake preparedness kit. Maps – Part of your shareable family emergency management plan should include quick access to local maps stored in your earthquake preparedness kit. The maps will help your party move to a new location to find assistance from FEMA, Red Cross, and other government agencies providing medical care, water, emergency food supply and personal items. Keep in mind that GPS usage may be spotty during disasters, and batteries may be hard to find, so having paper maps would be helpful too. Mobile Phones – Keeping a second mobile phone charger, solar charger or inverter in your earthquake preparedness kit will allow you to maintain contact with the outside world long after your battery has run out. Tools – While building a selection of tools for your earthquake kit, remember that a pair of pliers or a wrench may allow you to turn off your utilities at your home. Dust Masks – Every member of your party wearing a dust mask will be able to filter out any harmful, contaminated air. Your earthquake kit should contain enough masks for everybody along with duct tape and plastic sheeting to create a shelter. Evacuation – Look for fire evacuation plans in your building. Finding a Safe Place – Choose a safe area in every room at school, work and home. Avoiding Windows If Indoors – Staying away from windows will prevent harm from shattered glass. Avoiding Dangerous Elements of Outdoors – Trees can fall, buildings collapse, and power lines snap. Avoid every dangerous element outside. Prepare for Aftershocks – Aftershocks are natural occurrences that typically ensue within minutes or days after the initial (earthquake). Help Those That Need Attention – If possible, provide assistance to everyone that requires special needs care after the (earthquake) and aftershocks. Once an earthquake hits, it is essential to keep away from any potential hazard including small fires, downed power lines, broken water lines, or escaping gas from broken pipes. Avoid spilled fluids, flammable liquids and other harmful contaminants. It is critical to only use your vehicle in an emergency and always prepare you and your family with a well-stocked disaster preparedness kit for the expected aftershocks that will follow the major disaster. Last edited by labatt; 08-10-2014, 01:44 PM. januz101 and troutski like this. Awesome article, Chris. Great read! I'm still working on mine, but I doubt I can top this piece. I've only had to deal with small tremors (mostly) here in Los Angeles and San Diego. Plus, I was just a baby during the Northridge quake in LA back in 1993, but that one was pretty big, I know that much. Thank you for sharing this helpful post, I only had one minor earthquake experience, and I was only in pre-school that time. Luckily no damage was done, only minor shaking on the ground. I will keep this in mind when forming my 1st aid kit. This is a very informative and interesting read. I live in Mississippi and have never experienced an earthquake, but I know we are way over due for one. This is an amazing article, Cris! Keep up the good work and you will have an awesome disaster website! Have you thought about posting this article on the front page and moving the forums to a separate tab? There aren't enough articles to really do that yet... but at some point, when we can get a regular group of volunteers writing articles, I'll be looking to make that change. That's why the forums live at /forums right now - as opposed to the root. Other camping gear to set up a temporary camp on the property or nearby park. Store plenty of light sticks and rotate them occasionally. Until the danger of natural gas or propane leaks is well past, do not use open flames, or electrical lighting that can ignite the gasses. At least one mountain bike for transport to and from information centers, water/food distribution points, checking on family and friends, etc. That's understandable. I'm sure you have plenty of ideas on how to transform this website and make it even better, you just need more people to cooperate. I hope you find them, I'm sure you will! One thing I should have mentioned, having lived in Senath, Missouri for many years, which is right on top of the main fault complex of the New Madrid Seismic Zone, is the possible need for a life jacket and some type of floating platform or boat in case of ground liquefaction or flooding caused by the earthquakes in that area. There are several other areas in the same boat (so to speak), such as the Carolinas where liquefaction and/or flooding can be a factor. Also, in these areas, where water courses abound, getting around without the benefit of bridges over them is going to require waterborne transport. We actually have a fairly large sailboat we lived aboard for a few years, and it's (unfortunately), now, north of New York City. It's our escape plan if the world goes to *bleep*, but it might prove to be difficult to get down the river if bridges collapse, or there's an event around the city. These are really rich source of information on earthquake preparedness. I didn't think it required so much. People and governments would only act after the fact but never before, which is kind of lame. Hopefully this gets much attention especially here in the third world where I am from. Thank you for this very informative article. I grew up in Mexico City where earthquakes are very common. Sadly, not too many people are well prepared there. More information like this needs to be disseminated, especially among those that live in poverty, who are the ones that always get affected the most. I was there during the 1985 big quake of magnitude 8.1 - quite frightening. The next day I volunteered at the Red Cross and it was shocking to realize what had happened in just a few seconds. Those are really useful tips, but I have to take issue with the statement "Over the last decade, the Earth has experienced higher levels of seismological activity – earthquakes. " If you look at the historical occurrences of earthquakes, we are not experiencing significantly more than any other time in history. We are experiencing more deaths and more destruction of property, but this is due to very human causes. Namely, we are populating more areas, and our population density continues to grow. The same earthquake hitting the same location two hundred years ago versus today can have very different consequences, as we have built more structures, larger structures, and there are more people per square miles. This still means the same thing as what you're suggesting: it's vital to prepare adequately. You are right, CooCat! there are *MANY* earthquakes every day, and always have been. However, labatt may have been hinting at the possible link between fracking and new earthquake activity, maybe? While it is true that we have always had earthquakes down through the ages, and may not be having more of them than before, it does at least seem like we are having more of the stronger quakes than ever before. Some of the earthquake graphs for different areas show a huge uptick in the magnitudes of earthquakes in that area. Volcanoes are also more active than ever before. as with earthquakes, we have always had active volcanoes; but now we have more of them active at once that we have had in times past. Last edited by Tumbleweed; 09-02-2014, 06:22 PM.